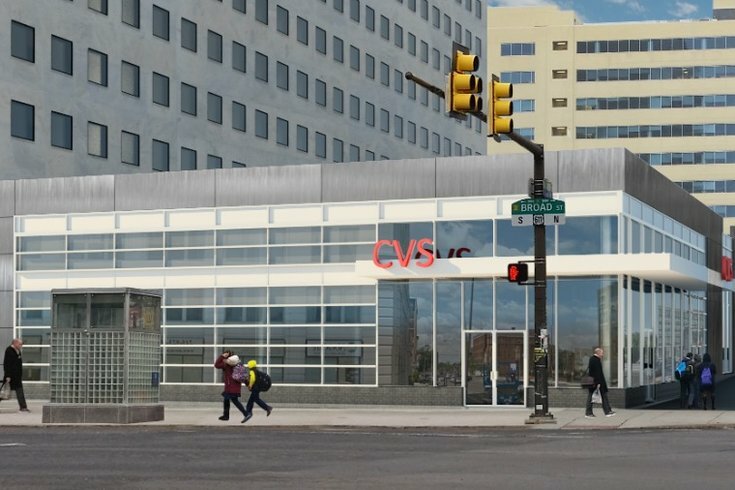 A rendering of the CVS slated for the corner of Spring Garden & N. Broad Streets. Bart Blatstein, the man behind some of Philadelphia's biggest (and, at times, controversial) redevelopments, has plans to bring another chain (or several) to North Broad and Spring Garden streets in the form of an 11,000-square-foot CVS. The section of land, which stretches along Spring Garden from Broad to 15th, sits beside Blatstein’s 17-story Tower Place luxury apartment complex, which opened about five years ago at the old State Office building. That development called for altering a building now 60 years old, giving Blatstein use of historic tax credits for the project. Part of the agreement said he could not alter the property any further … for at least five years. Tuesday MSC Retail published a brochure detailing the proposed storefronts coming to the area, revealing signed leases for both a CVS and a Citizens Bank. A Sprint store and Starbucks are also mapped on an “at lease” status, while a Pet Valu has also been proposed. Up to 8,000 square feet of retail space are still available. Retail outlined for the corridor at North Broad and Spring Garden Streets. Plans for the developments are slated to wrap in the first quarter of 2019, according to the brochure. A zoning permit was secured by Blatstein last month. As part of the ongoing developments populating North Broad Street, the proposed new storefronts would neighbor another proposed residential building mirroring Tower Place, at 1401 Spring Garden. The space would include 144 apartments, an 18-story office building, and another 87,000 square feet for retail space.